Pope Francis has approved lifting the ban on the ordination of married men to the priesthood in Eastern Catholic Churches outside their traditional territories, including in the United States, Canada and Australia. It is understood that the ban was never applied in Europe, and in recent years, some Eastern Catholic bishops went ahead with such ordinations discreetly without Vatican approval. Cardinal Leonardo Sandri, Prefect of the Congregation for the Eastern Churches, signed the decree on 14 June and it was made public this week. Melkite Bishop Nicholas Samra of Newton, Massachusetts told the US-based Catholic News Service on 15 November: "We are overjoyed with the lifting of the ban. In 2010 members of the Synod of Bishops for the Middle East formally asked Pope Benedict XVI to drop the prohibition. At the end of the 2010 synod Cardinal-designate Antonios Naguib, patriarch of the Coptic Catholic Church, said, "It's a practical problem; it is not a theological problem." If it were a theological problem, he said, the Eastern Churches could not have married priests in their home territories. 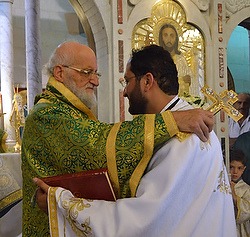 "The whole Catholic Church confesses and confirms the richness and the gift of priestly celibacy for the life and mission of the church," he said, but the Eastern churches also value the ministry of their married priests. "In the past, only Eastern-rite priests could be married," he said. "But now with the admittance of former Anglicans, we ask that these old prohibitions change so there would be equality" between what the Latin and Eastern bishops are allowed to do. The Vatican introduced the prohibition in 1929 after Latin-rite bishops in North America and other areas told Rome that the presence of married Eastern-rite priests was creating confusion among their faithful. The order banned Eastern Churches from ordaining married men in the West and from sending married priests to the West. In 1998, the bishops of Australia issued a formal statement saying they had no opposition to married Eastern priests in Australia. The US and Canadian bishops have expressed similar opinions, although not as formally. And for at least the past 10 years, some Eastern Catholic bishops have been ordaining married men in North America or accepting married priests from their Church's homeland. In 1998, Cardinal Angelo Sodano, then Vatican secretary of state, ordered Ukrainian Catholic bishops in Poland to use only celibate priests and to send their married priests to Ukraine. He said the bishops could not "unilaterally modify the practice in use".